Each year migrating Dolphins & Whales swim for their lives in Taiji, Japan and in The Faroe Islands. Share their stories! Click here to download the print version of our WOW Informational Brochure. 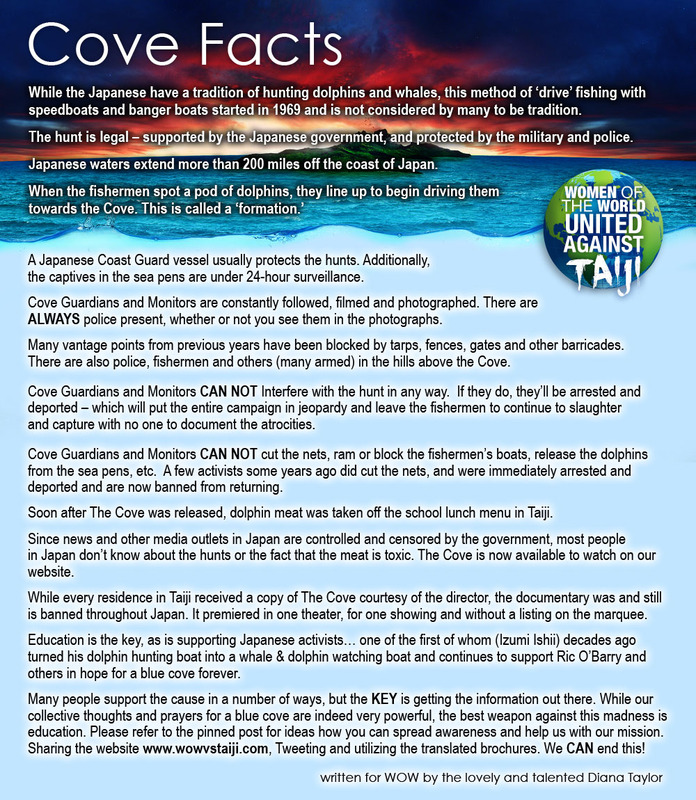 Download the STORY of TAIJI as a pdf here. A small fishing village in Taiji, Japan where a couple dozen fishermen reside is also a place where drive hunting happens for the captive industry. It is not all the people of Taiji and not all the people of Japan. The Taiji fishermen involved in the drives, hunt, kill and/or capture dolphins from September to March every single year. Slaughtering, capturing, selling and even consuming dolphin meat. 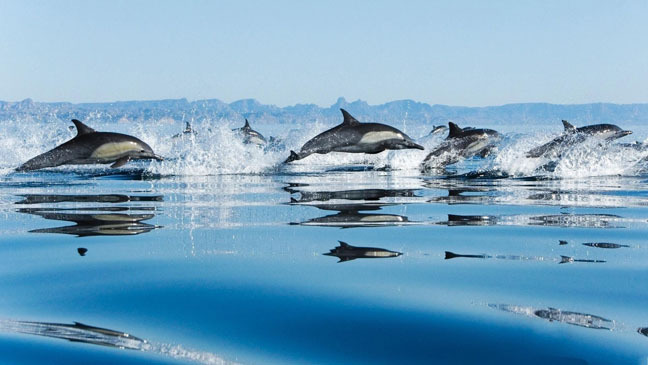 Between the number of dolphin that are driven into the Cove every season, all those who die in captivity and all the stillborn babies that never had a chance, the numbers of pods coming by the Cove seem to be dwindling each year. The Fisheries quota is not being met. Is it because they are depleting the dolphins before they even have a chance to recover? A calf will usually nurse from 11 months up to 2 years and will stay with it's mother until it is between 3 and 8 years old. In places like Taiji, Japan they are given orders from Marine Parks to capture dolphins for your entertainment and they kill hundred's of dolphins per season. Some for meat and the rest to sell to Marine Parks around the world. (6 months every year, September - March) Please pledge to never visit a captive facility and the spread the world that captivity kills. Click here to download the print version of our Faroe Island Brochure. Download the STORY of THE FAROE ISLANDS GRIND as a pdf here. The Grind that takes place in the Faroe Islands every year, is an event where they kill hundreds of migrating Pilot Whales. Pregnant females are not spared. The meat is divided among those who participate in the killing. It also winds up in shops for sale. Whale and Dolphin meat both contain high levels of mercury and PCB's. The Oceans belong to us all and when it dies, we too will die. Make your voices heard! Speak up for the captives and the migrating dolphins and whales who have no voice and help us end this abuse of cetaceans everywhere. We believe in the preservation of our oceans and we support the efforts of Sea Shepherd and Ric O'Barry's Dolphin Project. Did you know in the Cove in Taiji some babies are taken back out to sea and dumped after they have witnessed their entire family being slaughtered in front of them? It's true and horrifying for these young calves.